I'm so excited about today's post! I just got back from the beautiful Cartagena, Colombia. Cartagena has been one of my top destinations in South America for the past few years. My trip was in partnership with Spirit Airlines. I was overjoyed with the opportunity to explore this amazing city with one of my go-to airline companies. For all my fellow Orlando residents, Spirit recently added 11 new international direct routes from our hometown. How convenient is this for those of us who want to travel more frequently by offering lower fares to destinations in the Caribbean, Central and South America? In 2018, Spirit Airlines added an additional perk by incorporating Wi-Fi, it’s all about keeping us connected while in the air. Cartagena far exceeded all my expectations! From its colorful vibrant colonial buildings to its one of a kind Colombian culture. It has the most picturesque streets I’ve ever seen. 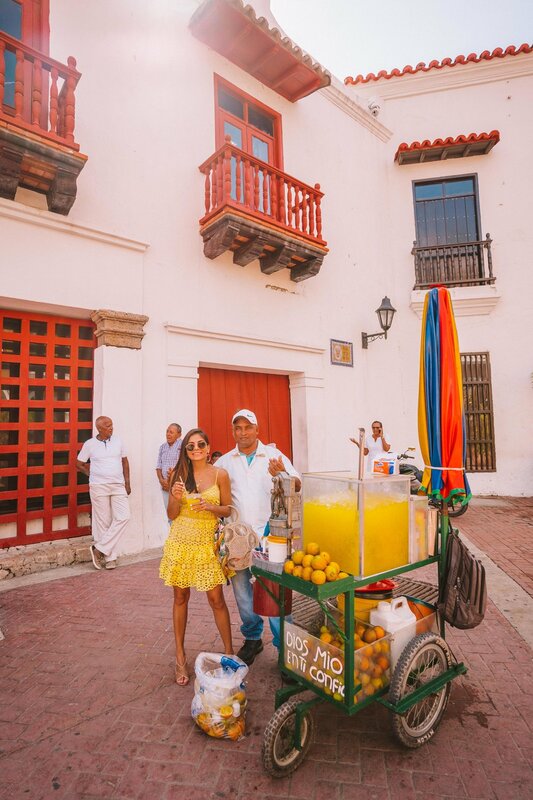 I wanted to try something new while in Cartagena; my husband and I wanted to get lost, meaning we didn't have an itinerary. We wanted to experience first hand the Colombian culture, so we took it day by day, not rushing and letting it all sink in. The city is divided into two parts: The Walled City and the modern skyscrapers in Boca Grande. We enjoyed most of our time in the historical Walled City which is surrounded by cobbled alleys that can be explored by horse carriages day and night, balconies covered in beautiful flowers and fresh fruit stands. Coconut and lemonade stands kept us refreshed as it got very hot throughout the day. 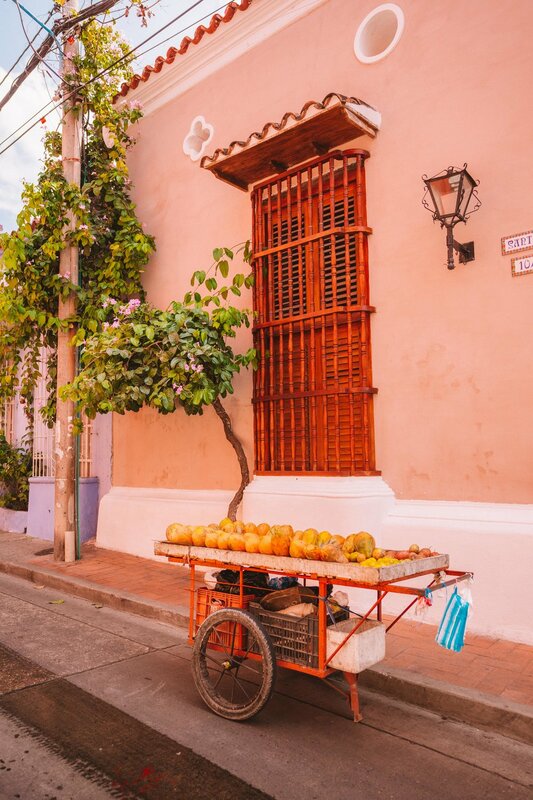 So do keep in mind if you are planning to visit Cartagena pack smart by incorporating lightweight natural fabrics, comfy shoes, and don’t forget your sunscreen. We enjoyed eating and drinking in the nearby restaurants, overlooking the fascinating churches and its unique colonial architecture. You will find all your souvenirs as it's surrounded by boutiques and handcrafts, so make space in your luggage to bring back lots of goodies. - Casa Pombo: located in the heart of Old City, it offers a more private and luxurious accommodations. Daily rates vary from $190-$220 a night. Want to watch an unforgettable sunset while drinking up some Mojitos? Make sure to visit Movich Hotel, for mesmerizing panoramic views of Cartagena. In the Old City, you will be greeted by the “Palanqueras” dressed in colorful tradition Colombian attire. 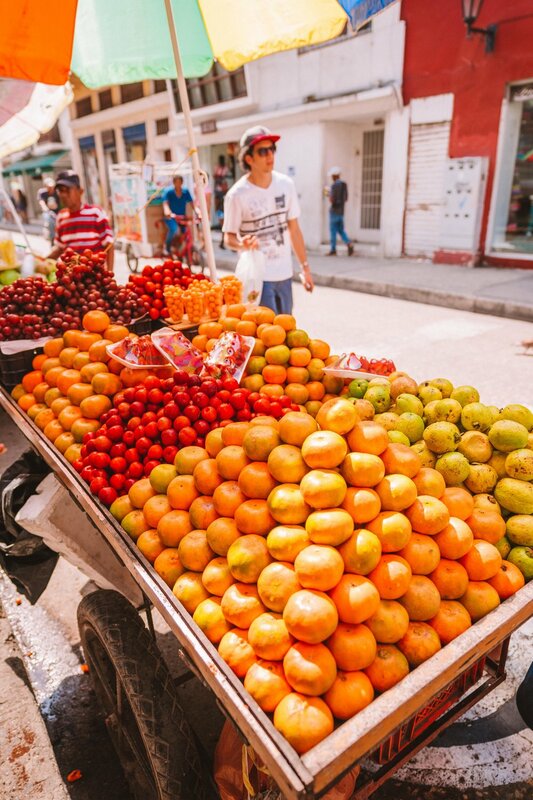 They make a living by taking photos and selling fresh fruit. Take a boat tour: we took a private boat tour to two of Cartagena's most beautiful islands Bendita and Agua Azul beach. We wanted to relax and escape the city life. We were blown away by the color of the water, literally 50 shades of blue. Castillo San Felipe de Barajas: it was built by the Spanish during the colonial era and offers breathtaking sea and city views. Discover some of the most beautiful plazas in Cartagena. Cafe Havana: known for its night live salsa music and yummy cocktails. Getsemani- Full of street art. You will have an authentic experience. Last, but not least, wander and get lost. Walking makes me feel like a local and allows me to find the cutest spots. I highly recommend you to visit Cartagena, you won't be disappointed. I personally, can't wait to be back to this magical city. If you guys are planning to visit Cartagena and have any additional questions please comment below, I would love to help! I hope you guys enjoyed this post, until next time!